Highly trained and experienced production staff manufactures the finest outdoor aluminum furniture you can buy. The company is proud to offer "Made in Greece" products from our factory in nearby Athens where 80% of our products are manufactured. It began in 1979 along with the youthful dreams of its founders. Over the years our factory workforce has been continuously trained to become highly experienced and very skilled in the craftsmanship of our folding aluminum furniture. We would like to give you the opportunity to check for yourself the different stages of our production procedure meticulously performed by our factory workforce, by clicking on the relevant videos below. Forma Marine products are prepared with a lot of care and precision by our workforce in the factory. Our skilled workers complete all the stages of production until their delivery. You can see how this marine table top is processed and assembled before completion. Our highly specialized personnel treats the wood we use on our products with care and respect in order to obtain beautifully crafted table tops in numerous sizes. 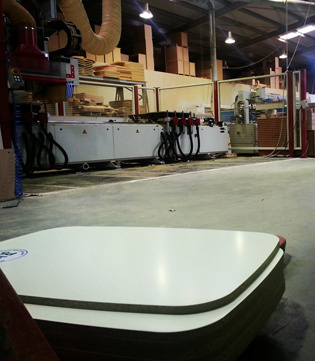 Melamine table tops also used for the assembly of our tables are treated with the use of technologically updated machinery. This gives them a smooth finish and soft shapes. High Quality Anodization Process of Forma Marine that ensures the durability of all aluminum parts in the harsh sea water environment. Forma Marine products are 'born' in the factory. Our skilled workers complete all the stages of production until their delivery. One of the very delicate process is casting the chair parts. You can see how this is performed and under extreme temperatures. The plastic parts we produce are manufactured by primary materials; this allows these parts to have an excellent operational behavior combined with friendly shapes. Forma Marine products are prepared with a lot of care and precision by our workforce in the factory. Our skilled workers complete all the stages of production until their delivery. You can see how thisa marine table top is processed and assembled before completion. CNC Lathes are used for the production of plastic and metal parts.